The ascension is the ritual whereby the soul reunites with the Spirit of the living God, the I AM Presence, through the acceleration by the sacred fire at the natural conclusion of one's final lifetime on earth. 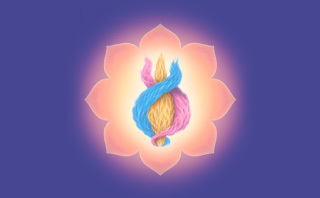 It is the process whereby the soul merges first with the Christ Consciousness and then with the living Presence of the I AM THAT I AM, having balanced her karma and fulfilled her divine plan. Once the ascension takes place, the soul—the corruptible aspect of being—becomes the incorruptible one, a permanent atom in the body of God, free from the round of karma and rebirth. In reality man is a flaming spirit who descended into physical form to master the conditions and trials of everyday life and his own lower self. When he has successfully overcome the human will, the human ego, the human intellect and has replaced them with their divine components, he can then ascend back to the heart of the Father-victor over time and space. The ascension is the gift of God. It is given to us more by his grace than by our works, although both are necessary. Membership in any specific church does not in itself guarantee our ascension. Devotees from all races and religions have been granted the gift of the ascension when certain requirements have been met. The ascension flame is a flame of hope. We have hope because we have within us the divine memory of the ascension of Jesus the Christ. Our souls remember that Mary, the Mother of Jesus, and others who are unknown and unsung have also followed in Jesus' footsteps as the true heroes and heroines of the world. 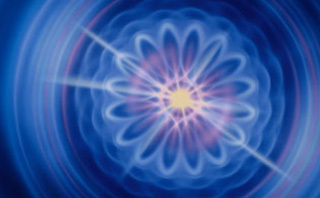 Jesus' ascension is the matrix of the ascension of every other soul. His life was meant to be an example to us, and we are intended to ascend as he did. The mysteries of God's creation are many, and Jesus unveiled for us one of life's greatest mysteries. 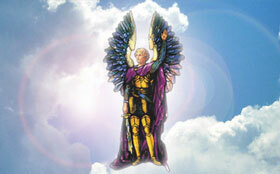 The ascension is God's desire for every one, and so all of Heaven – Ascended Masters and Archangels – stands ready to assist the man, woman or child who seeks to express his or her true identity as a son or daughter of God. All life should welcome the opportunity we have been given to follow in the Master's footsteps. Jesus was a wayshower, one of many. The ascension flame is an intense fiery white with a crystal glow. The Easter lily is the symbol of the flame and its focus in the nature kingdom. The white diamond is its focus in the mineral kingdom. The melody of the flame is the Triumphal March from Giuseppe Verdi's Aïda, and the keynote of the retreat is Liebesträume by Franz Liszt. The melody of Celeste Aïda contains Serapis Bey's own keynote. 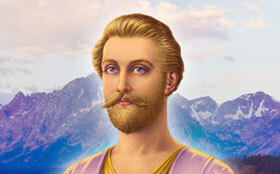 Serapis Bey shows that the ascension, the soul’s reunion with God, is the goal of life for all. He gives practical keys for spiritual growth that can help you earn your ascension.